Mutant Football League is an action packed, arcade style football game with intense online multiplayer action, deep strategy, and deadly humor. 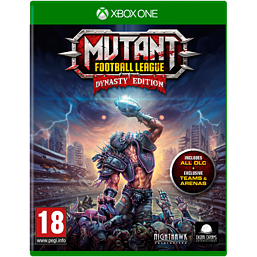 Dynasty Edition includes all DLC and brings several new features to the core game including a new single player experience that allows players to become the coach and GM of their favorite Mutant Football League franchise. It includes multiple season gameplay, player trades, cumulative player XP, salary management, custom playbooks and free agent signings. Players will have the chance to turn mushy unproven, low-rated rookies into monstrous all-stars by winning multiple Mayhem Bowls over several seasons, creating their own Dynasty. Rampaging Werewolves and Hell-spawn Demons join the fray in Dynasty Edition which also introduces six brand new teams, several new Dirty Tricks and of course more fantastical arenas full of ruthless fans and deadly traps. As always, players can win by highest score or by decimating your opponents. Whenever a game begins you’ll quickly discover the only predictable element is broken bones and fun. Mutant Football League – we’re putting the fun back in football. Mutant Football League is the bloody-fun next generation, spiritual successor to the retro classic, “Mutant League Football,” designed and produced by Michael Mendheim, the creator of the original game which means you can expect deep strategy game-play, bone crunching, tooth shattering hits, and a roster of ghouls delivering tongue-through-cheek humor. Oh, and blood. Lots of blood.